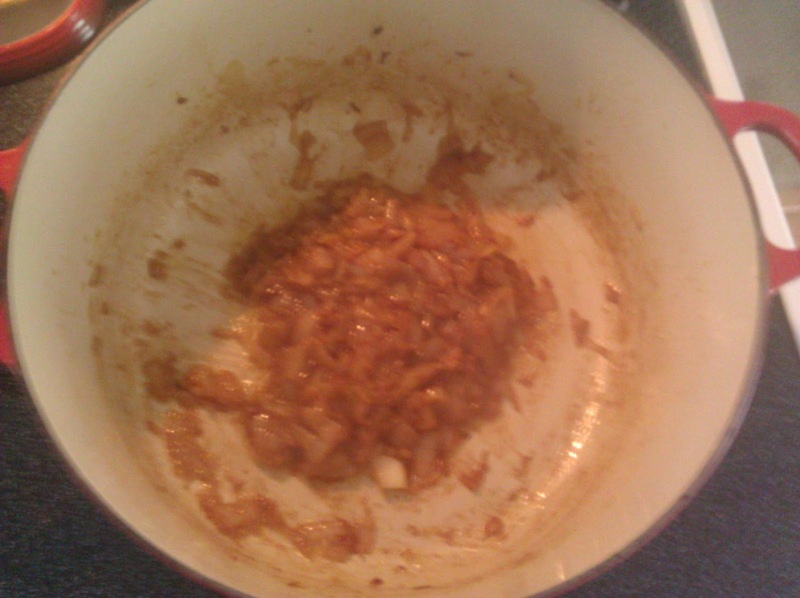 When onions are caramelized, they undergo a delectable transformation. By slowly cooking the onions over a low heat, the moisture gets cooked out and the natural sugars develop and brown (the caramelized part.) 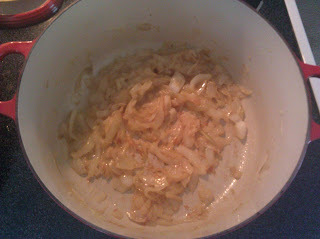 Caramelized onions are very versatile. 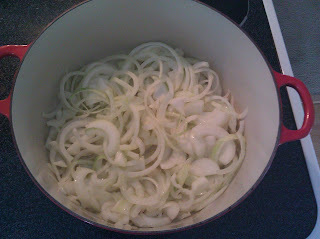 I use them a lot in savory tarts, and they are the classic ingredient in french onion soup. One of the most important things to remember is that since the moisture is cooked out of the onions, they will really decrease in volume. If you start out with your pot half full of sliced onions, you'll probably only have enough caramlized onions to coat the bottom of the pan when you're done. In the pictures below, I used 3 medium onions, cut in half, and then sliced thin. If slicing onions is a tearful experience for you, just do it as quickly as possible, or use whatever tricks work for you. I've heard people say that slicing onions when they are really cold prevents a lachrymose (crying) experience, as well as having a metal spoon in your mouth. There's even onion goggles. 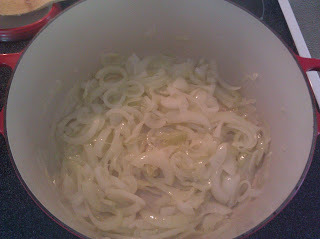 After your onions are sliced, place them in a dutch oven or other large pot over medium heat, uncovered. 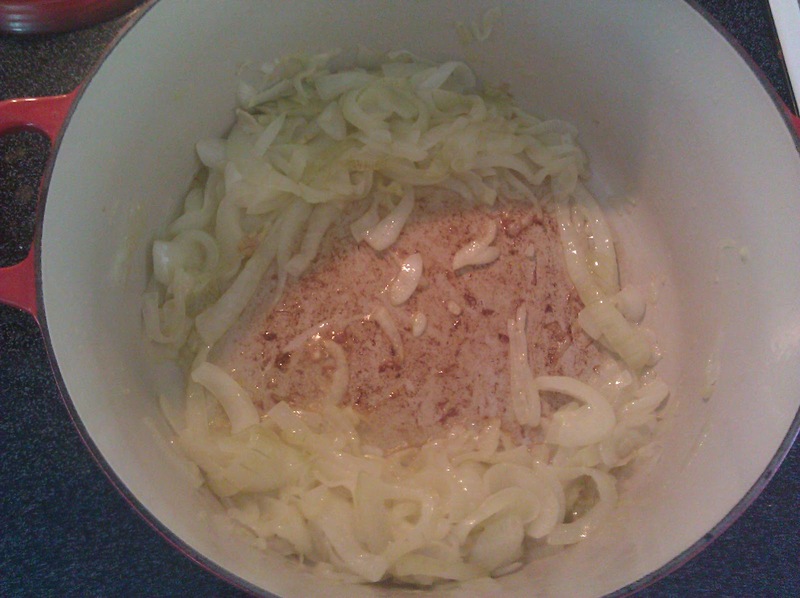 Add a generous pinch of salt and give the onions a stir. You really won't see anything for the first 10-15 minutes, other than the onions steaming. Just stir them every once in a while, and you'll notice they begin cooking down. After about 25-30 minutes, the onions will start to brown, and you'll notice they will begin to smell sweet and not as "oniony." When the onions start to brown, stir them often, and watch for the development of brown, crusty bits on the bottom of the pot. This is known as "fond" (from the French word for "bottom" ) and it has tons of flavor. You'll need to add a small amount of liquid (less than 1/4 cup) to the pan to loosen those brown bits so they end up in your final dish, and not stuck to the bottom of your pot. You can use water, chicken/beef/vegetable broth, or any other liquid that your recipe calls for. Add it in and scrape the pot with a wooden spoon to get the fond up. Keep cooking and stirring the onions for 10-15 minutes more, deglazing as needed if the bottom of the pot starts to darken. You'll know the onions are done when they're a deep brown, and a jam-like consistency. Remove them from the heat and enjoy!